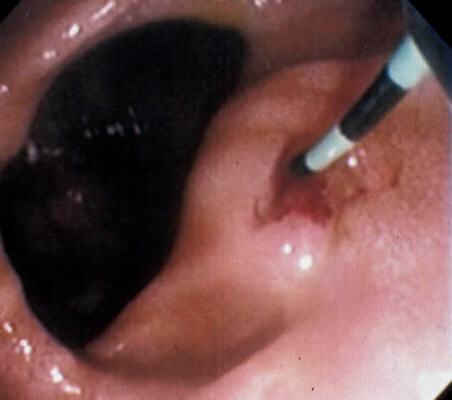 This is a technique used to extract stones from the common bile duct without resorting to open operation. A side viewing telescope is passed under heavy sedation down the mouth, gullet and stomach into the second part of the duodenum and positioned opposite the ampulla where the bile duct and pancreatic duct open into the duodenum. By passing a fine catheter into the ampulla either the biliary tree or the pancreatic tree may be opacifect and X-rays taken. ERCP showing multiple stones in common bile duct. If stones are seen in the bile duct the ampulla can be cut open with a wire (sphincterotome) and the stones then extracted. 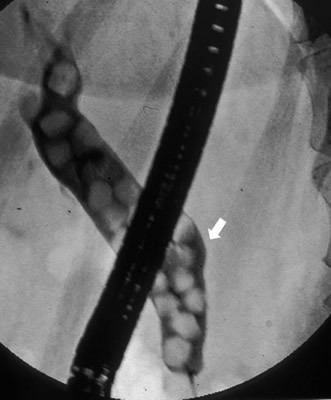 ERCP duodenal view showing ampulla next to a diverticulum (pouch) cannulated. Ampulla opened and stone seen to be emerging. The commonest complication of ERCP is acute pancreatitis which may be severe in a small proportion of patients. This can lead to a prolonged period in hospital. This is a rare ( 1 in 1000) and very serious complication which may require emergency surgery to repair the perforation. 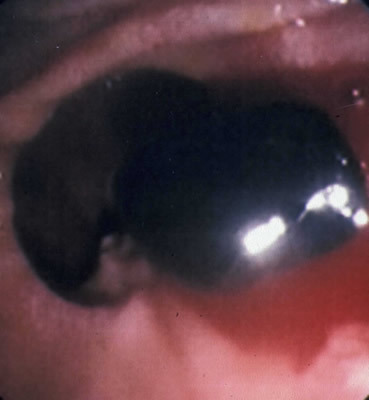 If a sphincterotomy is performed to release gallstones from the common bile duct this may be followed by bleeding from the sphincterotomy site in a small number of patients. In this circumstance a blood transfusion may be required. Occasionally patients continue to bleed and require a further endoscopy and injection of the bleeding point with adrenaline. If this fails to staunch the problem angiography and embolisation or even emergency surgery to under-run the bleeding point may be necessary.